People who are loyal are committed, and they don’t allow their commitment to be swayed by difficult circumstances. They are loyal during the good times and the bad times. That’s why relationships built on loyalty are able to withstand unexpected setbacks. 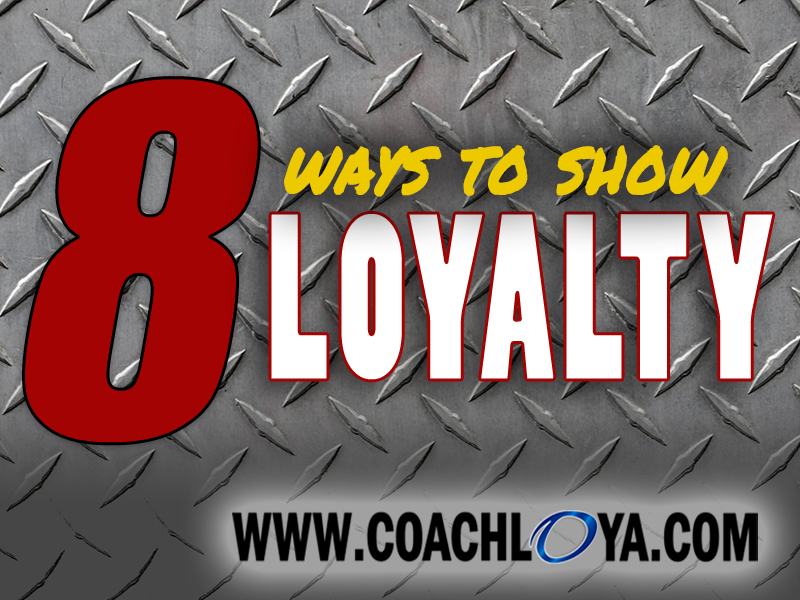 When a teammate you care about finds himself or herself in a precarious situation requiring your support, you need to effectively convey your loyalty to that person. Be Seen with Him/Her When “it” hits the fan, don’t fade into the shadows and distance yourself from those to whom you are loyal. Your physical proximity speaks volumes. Standing beside or behind your teammates during their moment of peril lets them know you aren’t worried about what others may say or think about your association with them. Your outward sign of support is a gesture of solidarity that will not go unnoticed. Eliminate “I Told You So’s” Being loyal isn’t about second guessing, nor is it about pouncing on the moment of failure. Individuals who rush to say “I told you so” when things go by the wayside emit a toxic, judgmental vibe. They are usually the same individuals who rush to assign blame and say, “It’s not my fault.” Their choice in words are divisive and carry a defensive tone. It makes it seem like they are more worried about protecting their image than supporting yours. Loyal teammates prize unity, not separation. Keep your “I told you so’s” to yourself. Follow Through on Commitments Nothing reinforces loyalty like being trustworthy. If you make a commitment, honor it—even if it is hard to do. Related to the previous point about “I told you so’s,” if you committed to a plan that happens to fail, despite your original objections, don’t gloat about being right. Focus on fixing what went wrong, as if the plan that failed was your idea. Honor your commitment and let your word be your bond. Avoid gossip You don’t want the person to whom you are trying to show loyalty to become suspicious of your intentions. Gossip will most certainly cause this to occur. Sneaky teammates aren’t loyal teammates. Don’t talk about your teammates behind their back. And if others around you are gossiping, don’t participate. Even the perception of you gossiping about your teammates jeopardizes the relationship. Stand Up for Him/Her Sometimes you need to let your teammates know you’ve got their back. Although you want to avoid gossip, if you hear others speaking falsities about your teammates, set the record straight. Stand up for them with unwavering conviction. Standing up for those who cannot stand up for themselves is an incredibly powerful good teammate move. Confide in Him/Her When you want others to trust you, show that you are willing to trust them. Confiding a personal experience or a private detail about yourself, especially if it is something that makes you appear vulnerable, builds a bond between you and the recipient. Knowing that you are willing to share that sort of intimate information with them establishes trust and affirms your loyalty. Speak honestly You might not agree with the choices your teammates made that caused them to need your support. However, tiptoeing around the issue and avoiding discussing it with them probably won’t demonstrate your loyalty. In fact, it may actually cause your teammates to become skeptical of you and wonder why you aren’t mentioning the issue. Letting them know your honest opinions sends the message that while you may not agree with their actions, you still believe in them. You let them know that you aren’t willing to throw the proverbial baby out with the bathwater. Don’t compromise your integrity You may be tempted to behave immorally or act unethically or even unlawfully to support your teammate. But don’t do it. A teammate worthy of your loyalty would never expect you to act immorally, unethically, or unlawfully. You might think you’re conveying loyalty with your improper actions, but what you’re really conveying is your willingness to be dishonest. If your teammates know you are capable of compromising your integrity for them, then they surely realize you are capable of doing the same thing to them, if you are ever backed into a corner. Loyalty is a gift you give to others without the expectation of getting anything in return for your gift. Good teammates are loyal to those they believe in because it’s the right thing to do, not because of what they may receive in exchange for their commitment.